The death of Tony Sparano draws an eerie parallel with another tragic loss for te Minnesota Vikings. When the news broke early Sunday afternoon, in the final few days of the offseason, the flashback felt like the worst possible kind. The stunning death of Vikings offensive line coach Tony Sparano eerily bore so many similarities to another tragedy the Minnesota organization endured 19 years ago — the sudden passing of offensive coordinator Chip Myers in late February 1999. The likable and popular Myers was only 53 when he died; Sparano was just 56. Both veteran coaches had earned the respect and friendship of all those they worked with and led. Their early deaths were both due to heart issues, with Myers being felled by a massive heart attack at home in suburban Minneapolis hours after returning from the NFL Scouting Combine in Indianapolis, and Sparano succumbing to heart disease, again at home in the Twin Cities, just two days before the start of training camp. When Myers died, just a few weeks after being elevated from Vikings quarterbacks coach to his dream job of offensive coordinator by head coach Dennis Green, I was starting my fourth year covering the team as a beat writer for the Minneapolis Star Tribune. I covered Myers’ funeral in Cincinnati, and later that year went back to the Queen City to do a long feature on the effects that his shocking death had on his wife, Susie, and their five adult children, so the story became etched in my memory. I only casually knew Sparano from interviewing him a few times over the course of his long NFL coaching career, mostly at training camp stops or league meetings. Like Myers, he had the rare gift of being beloved by both his players and the league’s coaching fraternity. Stylistically, Sparano was as gruff and intense as Myers was calm and laid back, but they both got the job done in their distinctive ways and left considerable voids with their deaths. In yet another twist, these Vikings, as they were in early 1999, are coming off a season in which they had legitimate Super Bowl dreams, advancing all the way to the NFC Championship Game before losing. The 1998 Vikings are legendary, going 15-1 in the regular season and taking the league by storm before their epic overtime loss to Atlanta at home in the playoffs. The 2017 Vikings were distinguished as well, going 13-3 before suffering that galling blowout loss at Philadelphia, just one game shy of making history as the first team to play a Super Bowl on its own home field. Myers, a one-time Pro Bowl receiver with the Bengals, had waited 15 years before getting his shot to coordinate an offense, receiving the promotion from Green to replace offensive coordinator Brian Billick, who left the previous month to become Baltimore’s new head coach. 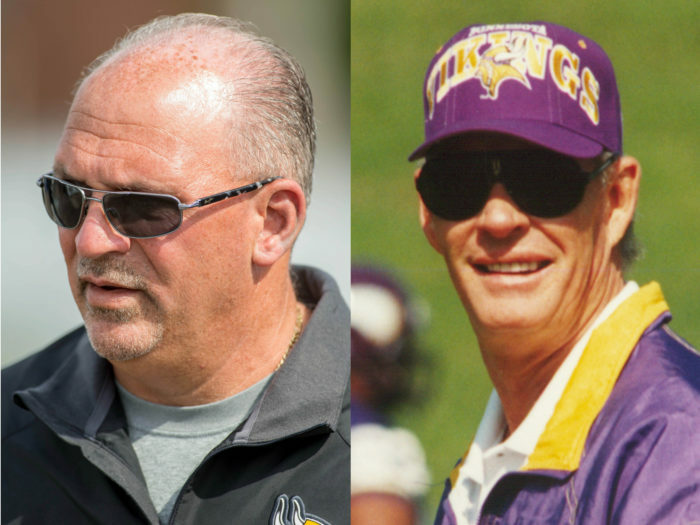 Myers had been the Vikings receivers coach from 1995-97, then coached the team’s quarterbacks during its record-breaking run of 1998, overseeing Randall Cunningham’s career renaissance season. The 1999 season promised to be the most high-profile opportunity of his coaching career. Sparano started his NFL career in that same 1999 season, serving as an offensive quality control coach under Chris Palmer for the expansion Cleveland Browns. With head coaching stints in both Miami (2008-2011) and Oakland (2014, as interim), and a stint as the Jets offensive coordinator in 2012, Sparano already had scaled the mountaintop in his profession to a degree. But he was an extremely valued and experienced member of Mike Zimmer’s Vikings staff in 2016-2017, helping a young and ascendant team mold a tough, tenacious style of play and personality. The Vikings, much as they were 19 years ago, are no doubt reeling from the shock of their loss. And with Sparano’s death coming in late July rather than late February, they have even less time to process it and try to move on than the 1999 Vikings did. History says it will not be easy, and sadly there are multiple parallels. The ’99 Vikings responded to Myers’ death by elevating quarterbacks coach Ray Sherman to offensive coordinator in March, but the move was far from seamless. Minnesota started painfully slow on offense that season, losing four of its first six games, before Green benched quarterback Cunningham in favor of the newly arrived veteran, Jeff George. Rallying behind the ex-Colts and Falcons starter, the Vikings won eight of their final 10 games and made the playoffs again, but were summarily bounced in the NFC divisional round at St. Louis. Green shook up his staff once again after that loss, firing Ray Sherman in January 2000 and replacing him with ex-Packers assistant Sherman Lewis. In the summer of 2001, another tragedy struck Minnesota, this time the heat-stroke death of Pro Bowl offensive tackle Korey Stringer, 27, early in training camp, on August 1. This time the shell-shocked Vikings never recovered from that cruel blow, and the season went downhill rapidly thereafter, with Minnesota finishing 5-11 and firing Green in the wake of the franchise’s first losing record since 1990. The 2018 Vikings, of course, are in their very formative stages and how they respond to Sparano’s untimely passing remains an unknown as training camp commences. It is simply too soon to know if the blow can be absorbed and his absence accounted for. Friday was supposed to be the day Minnesota’s veterans reported and the new season truly began. But it will now be the day the Vikings gather as a broken-hearted team to attend Sparano’s memorial service and pay their last respects to their one-of-a-kind offensive line coach. In the NFL, no matter the obstacles, the mantra says the game always keeps moving. But in reality, some losses are never completely overcome.